A bellwether of quality moviegoing at the beginning of 2015, “Paddington” could not have been more adorable and clever, honoring the charm, warmth and humor of Michael Bond’s cuddly, polite Peruvian bear in his first live-action feature film. Though a second installment was inevitable, “Paddington 2” is one of those uncommon sequels that is miraculously just as delightful, just as sweet as marmalade without turning maudlin, and just as tremendously funny without pandering. 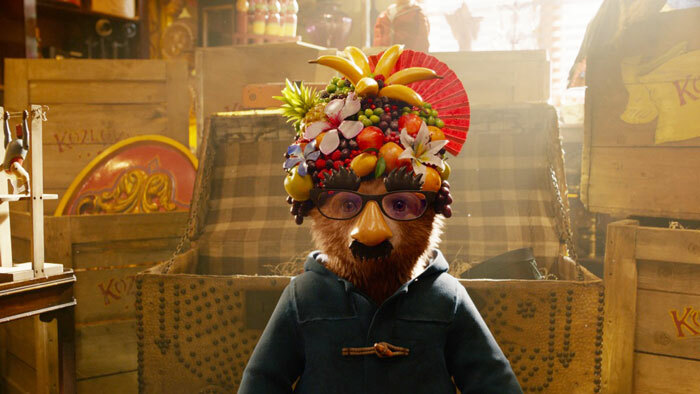 Writer-director Paul King returns to this rompish follow-up, alongside newly attached writer Simon Farnaby, and ups the ante just enough with another adventure for our favorite bear who never leaves home without a marmalade sandwich under his floppy red hat. It is absolutely impossible to resist. 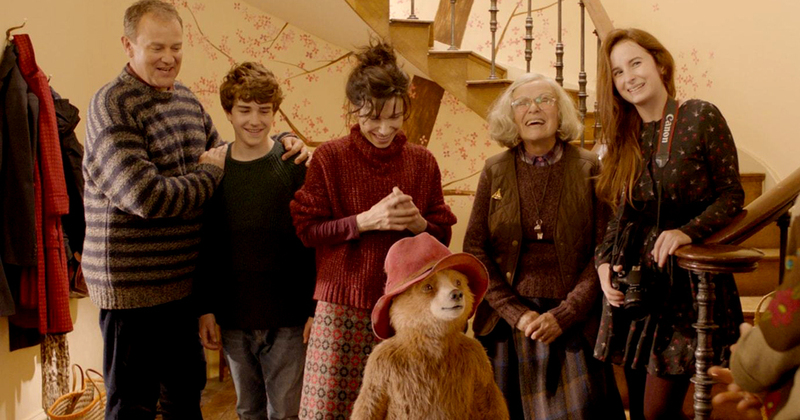 Paddington (voice of Ben Whishaw) is officially one of the Browns. 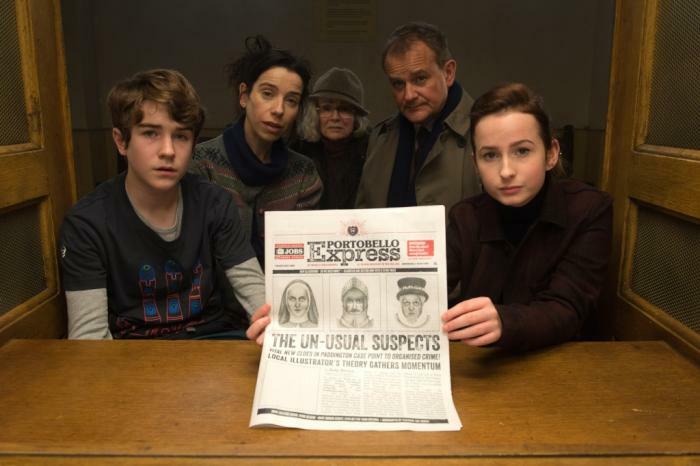 Happily living in the close-knit London neighborhood of Windsor Gardens with parents Henry (Hugh Bonneville) and Mary (Sally Hawkins), kids Judy (Madeleine Harris) and son Jonathan (Samuel Joslin), and live-in housekeeper Mr. Bird (Julie Walters), he is the glue that keeps the community running like clockwork. 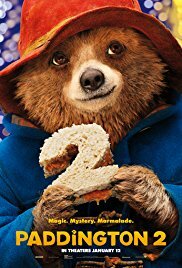 Working a number of odd jobs to get his Aunt Lucy (voice of Imelda Staunton) a birthday present for her 100th birthday, Paddington has his eyes set on a pop-up book of London—Aunt Lucy’s dream place to visit—but in the middle of the night, someone steals the book from Mr. Gruber’s (Jim Broadbent) antique shop and frames the bear. The thief happens to be the Browns’ celebrity neighbor, Phoenix Buchanan (Hugh Grant), an egotistical washed-up thespian who uses his mastery of disguise to look for clues that inhabit the pop-up book and lead to a hidden treasure. In the big house, Paddington first stands out like a sore thumb from all the criminals, but eventually, his love of marmalade rubs off on the inmates and the grouchy chef, Knuckles McGinty (Brendan Gleeson). Meanwhile, back in the Browns’ neighborhood, Paddington’s absence is felt, but his family will do everything they can to help clear their little bear’s name. “Paddington 2” is not only more sophisticated than most movies aimed at children and clear of snark and pop-culture references, but as a sequel, it never smacks of being made solely for monetary reasons. Without ever dropping the ball and coming off phoned-in, it is just as wonderful as its predecessor, recapturing the level of genuine care, charm and distinctly British wit that writer-director Paul King brought the first time around. A pop-up book sequence, in which Paddington imagines his visit with Aunt Lucy seeing all the landmarks throughout London, is a lovely and inventive flight of fancy. 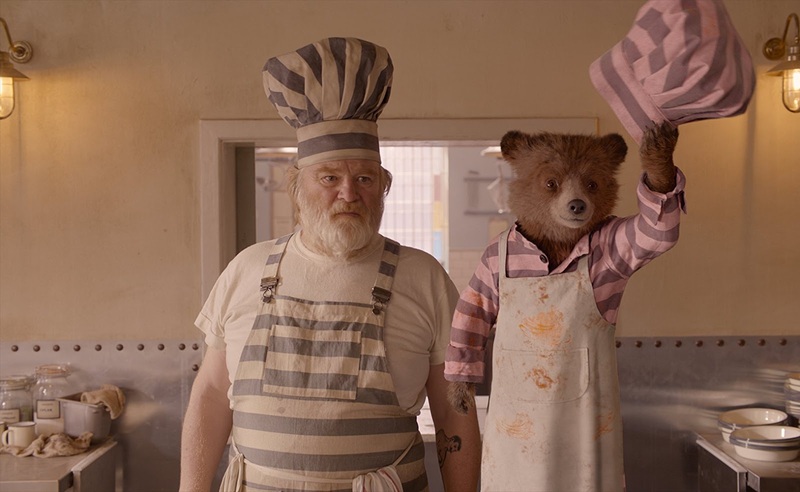 There is also some wonderfully inspired bits of slapstick, like the hijinks that ensue on Paddington’s last day of working as a barber’s assistant, the bear’s struggle at giving window-washing a shot, and a prison laundry mishap where Paddington accidentally turns all of the inmates’ uniforms pink. Reprising his vocal performance, Ben Whishaw makes Paddington every bit as endearing and lovable as before, pouring generosity and optimism into a tactile animated creation. The cast members playing the Browns still get plenty to do, including Sally Hawkins, a delight as always and bringing her innate joy and resourcefulness to the part of Mrs. Brown, who quickly figures out the identity of the culprit; and Hugh Bonneville is her equal match as Mr. Brown with a knack for goofy physical comedy when he and his wife break into Phoenix's home. 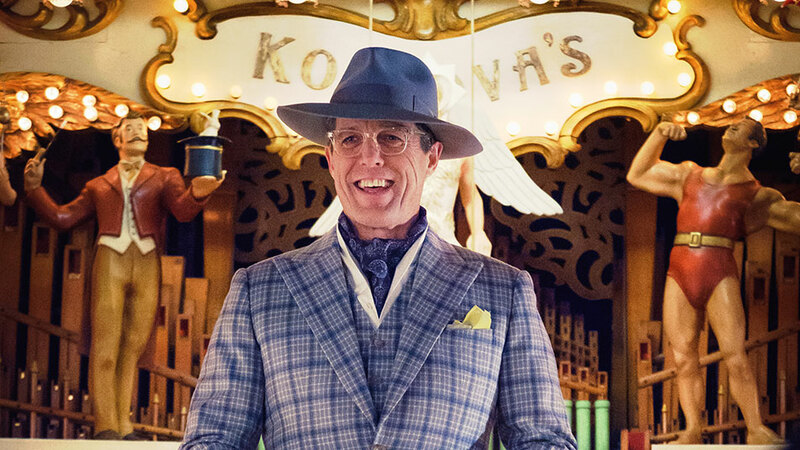 If Nicole Kidman injected a deliciously wicked edge to the first film as an evil taxidermist with a blonde bob, Hugh Grant is daffier and more flamboyant (the closing credits are a treat and give him his own musical number in a pink, bedazzled prison uniform) as the film’s antagonist, Phoenix Buchanan. As Grant only can, he mixes preening charisma and prickliness in the part of a hammy has-been actor and scoundrel he was born to play. Another new addition to the film is Brendan Gleeson, who can add the reputably intimidating prison chef Knuckles McGinty (on his tattoo, his name is spelled “Nuckle’s”) to his gallery of seemingly unsavory characters with a heart. The incident-filled plot is admittedly busy in retrospect, but in the case of “Paddington 2,” one will be having such a great time that it’s not even worth nitpicking. The promotional message that kindness always wins is also never heavy-handed or transparently wedged-in, warming even the biggest cynic’s heart. As Paddington quotes his wise Aunt Lucy—“If we’re kind and polite, the world will be right”—those hopeful words and this sequel already make the typically dour cinematic landscape of January look a whole lot brighter. 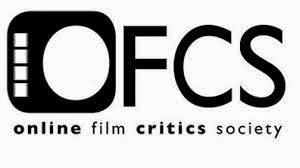 One cannot imagine this gem being forgotten by December, and entering into 2018, every movie has its work cut out for them.